Bloggers4UKIP: RadioFreeUK - Godfrey Bloom joins the line up, and the Facebook page is open for discussion. 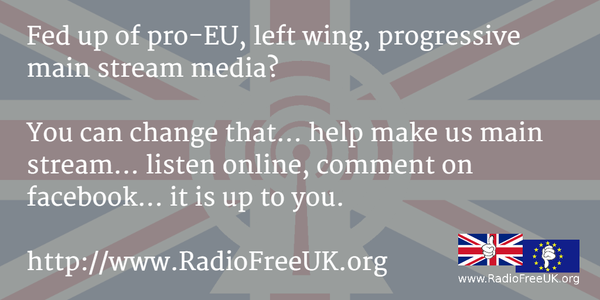 RadioFreeUK - Godfrey Bloom joins the line up, and the Facebook page is open for discussion. Now the whole programme is cross posted to Youtube too! Me, Vanessa Coleman, Alan Taylor-Shearer, Scottie K and new addition Godfrey Bloom. Godfrey is probably best known as the outspoken former UKIP MEP, but has a long track record of leadership and success in the military, as an economist and in business. He also has a number of published books to his name, and is a regular speaker at a number of universities on military and economic issuses. We are (of course) delighted to have him on board! - A radical 'Thought for the Day' - nice one Godfrey! - A belly laugh from Batsby, read by Alan Tayler-Shearer. And Facebook? All items in the programme are cross posted to our Facebook page and we will be working on developing an active facebook presence to generate discussion, support and feedback on our output - please do visit, like the page and please comment! New content, new contributors are always *welcome*.